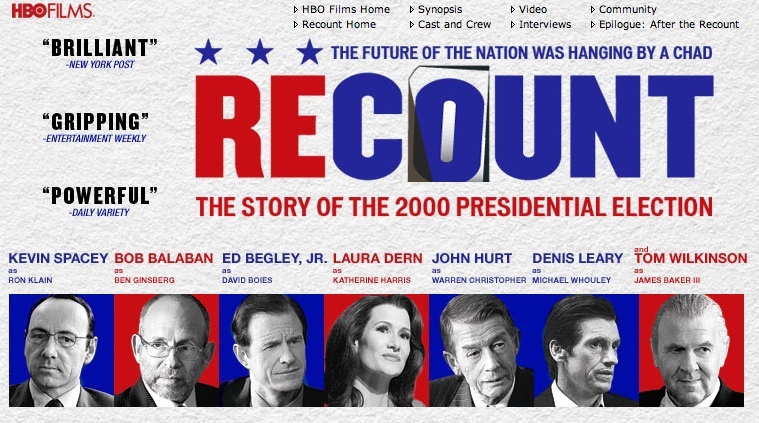 Recount, the made-for-HBO docudrama about the fiercely contested 2000 US presidential election, is beautifully Aaron Sorkin-esque. The two-hour series is an immense film; a harrowing tale of the fierce, domestic challenge for control of the western world. It’s one for the political junkies, the West Wing viewers who traded in their seven seasons of the Martin Sheen starrer for the $200 box set, just to glimpse the 30 minute documentary disc. Laura Dern is incredibly revealing as Secretary of State/Bush make up tin, while Kevin Spacey is similarly Sam Seaborne-esque. You might assume the movie is pro-Gore and anti-Bush, but you would not be quite right. Dave Grusin’s almost eerie score evokes a journey into uncharted territories and haunted lands, but that’s as close as it comes to making a statement (other than the incredulity voiced by the losers). The Democratic Party figures portrayed in the film have been the loudest in protest, especially Warren Christopher (John Hurt), who was the first head of the Gore team, and is portrayed as a wimp ready to cave in to the GOP. Whether the film is fair to him I cannot say. The movie will roll out internationally as the current US election heats up; Channel 4 and the BBC are understood to be vying for UK terrestrial and digital rights.